Ductile iron is characterized by having all of its graphite occur in microscopic spheroids. Although this graphite constitutes about 10% by volume of ductile iron, its compact spherical shape minimizes the effect on mechanical properties. The graphite in commercially produced ductile iron is not always in perfect spheres. It can occur in a somewhat irregular form, but if it is still chunky as Type II in ASTM Standard A247, the properties of the iron will be similar to cast iron with spheroidal graphite. Of course, further degradation can influence mechanical properties. The shape of the graphite is established when the metal solidifies, and it cannot be changed in any way except by remelting the metal. The difference between the various grades of ductile iron is in the microstructure of the metal around the graphite, which is called the matrix. This microstructure varies with composition and the cooling rate of the casting. 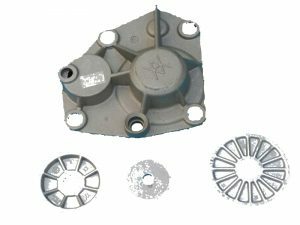 It can be slowly cooled in the sand mold for a minimum hardness as-cast or, if the aluminum die casting has sufficiently uniform sections, it can be freed of molding sand while still at a temperature above the critical and normalized. The matrix structure and hardness also can be changed by heat treatment. The high ductility grades are usually annealed so that the matrix structure is entirely carbon-free ferrite. The intermediate grades are often used in the as-cast condition without heat treatment and have a matrix structure of ferrite and pearlite. The ferrite occurs as rings around the graphite spheroids. Because of this, it is called bulls-eye ferrite. The high strength grades are usually given a normalizing heat treatment to make the matrix all pearlite, or they are quenched and tempered to form a matrix of tempered martensite. However, ductile iron can be moderately alloyed to have an entirely pearlitic matrix as-cast. The chemical composition of ductile iron and the cooling rate of the casting have a direct effect on its tensile properties by influencing the type of matrix structure that is formed. All of the regular grades of ductile iron can be made from the same iron provided that the chemical composition is appropriate so that the desired matrix microstructure can be obtained by controlling the cooling rate of the casting after it is poured or by subsequent heat treatment. For most casting requirements the chemical composition of the iron is primarily a matter of facilitating production. The common grades of ductile iron differ primarily in the matrix structure that contains the spherical graphite. 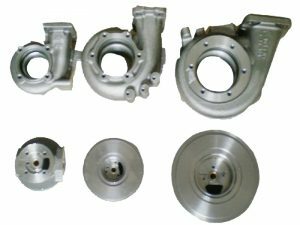 These differences are the result of differences in composition, in the cooling rate of the casting after it is cast, or as the result of heat treatment. Minor differences in composition or the addition of alloys may be used to enhance the desired microstructure. Five grades of ductile are classified by their tensile properties in ASTM Specification A-536-80, as shown in Table 5. The common grades of ductile iron can also be specified by only Brinell hardness although the appropriate microstructure for the indicated hardness is also a requirement. This method is used in SAE specification J434c for automotive castings and similar applications, Table 6. Other specifications for special applications not only specify tensile properties but also have limitations in composition. Because of the minimum influence of the spheroidal graphite on mechanical properties, the hardness of ductile iron is a very useful test and, with some reservations, can be directly related to other properties. The relation between tensile properties and hardness is dependable when the microstructure and chemical analysis are typical. This relation is not dependable if, for example, the graphite is very irregular or if the matrix contains primary carbides. The presence of unusual constituents in the microstructure such as primary carbides or the occurrence of other forms of graphite can affect some properties quite differently than others. The hardness of all graphitic irons is essentially the hardness of the matrix metal reduced to a somewhat lower value by the presence of the graphite. Graphite in a spheroidal shape does influence the hardness values obtained with conventional testers, but not as much as graphite in flake form. A martensitic ductile iron with an actual matrix hardness of Rockwell “C” 63-65 will indicate a hardness of 55-58. This effect presents no problem if it is recognized. The Brinell test is preferred for determining the hardness of ductile aluminium castings and typical values for different matrix structures are listed in Table 7. The commonly established tensile properties are tensile strength, yield strength and percent elongation. The minimums for these properties are typically established by the specification or implied by specifying the hardness of the casting. Because of the nominal and consistent infuence of spheroidal graphite, the tensile properties and the Brinell hardness of ductile iron are well related. The relation between tensile properties and hardness depends on microstructure. Ferritic matrix irons, often annealed, have a very low combined carbon content. Hardness and strength are dependent upon hardening of the ferrite by the elements dissolved in it, silicon being the most important. Manganese and nickel are also common ferrite hardeners. Pearlitic matrix irons have lamellar carbide as the principal hardening agent. Pearlitic irons containing free ferrite are in this group. A uniform matrix of tempered martensite produced by heat treatment has a somewhat higher strength to hardness relation. The acicular or bainitic matrix irons have a similar relation, but generally have a lower ductility at a given strength.